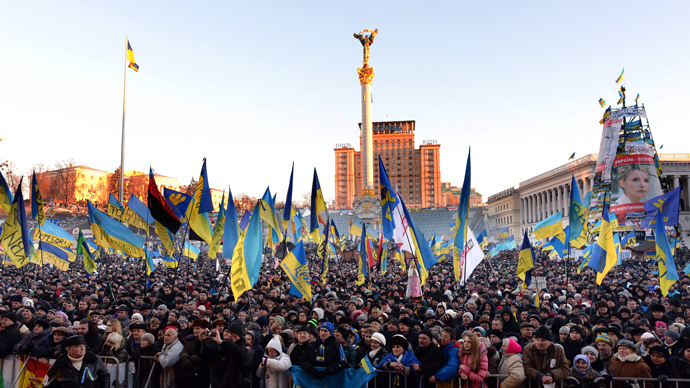 Tens of thousands of people from across Ukraine have gathered in central Kiev for rival anti- and pro-government rallies. 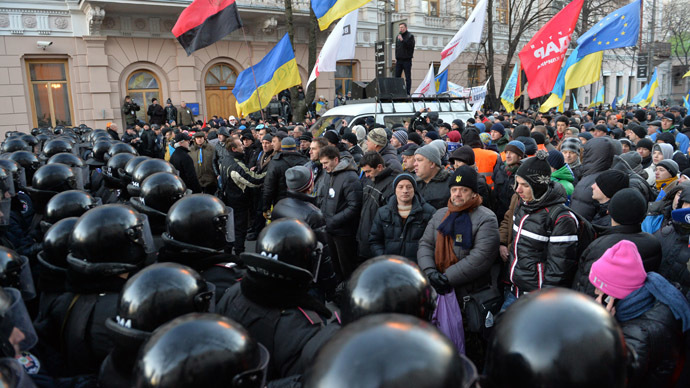 President Yanukovich suspended the city’s mayor and top security official over the brutal eviction of protesters. The Ukrainian ruling Party of Regions has estimated that some 200,000 of its supporters have come to Kiev's European Square to back President Viktor Yanukovich and his cabinet’s anti-EU move. Many of the banners read, "We’ll save Ukraine!" "There are many Kiev residents among protesters, who came to support the alternative point of view, which is different from the one being promoted at the nearby rally on Independence square,” the ruling party’s press office said. “They all unite in the opinion that it is necessary to stop the civil confrontation and restore peace and tranquility in the society." Many Party of Regions activists arrived in Kiev on Friday, with the largest groups coming from the major cities of Donetsk - where Yanukovych once served as regional governor - Lugansk, Sevastopol, and Dnepropetrovsk. "There are students, factory workers, coalminers and retirees," the rally’s coordination center said. "I have supported the Party of Regions since 2004. I should be here. It is my duty to be here because I trust our President," one of activists from the eastern city of Lugansk told AP. 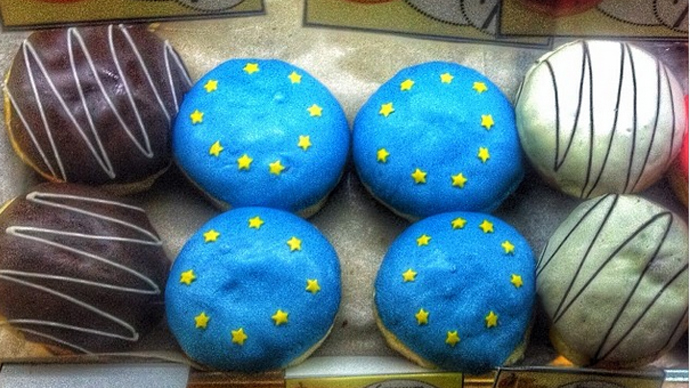 The Party of Regions has ruled out the possibility of resolving the country’s political crisis by force. "Any conflicts, the most difficult matters should and can only be solved by the negotiating table. People should not be driven away from their work, from their families," Prime Minister Nikolay Azarov told supporters as he opened the rally at 2:00 p.m. local time. The rally, which is set to last for two days, is just 200 meters away from Maidan - or Independence Square - where the opposition’s supporters have been camping out for three weeks of protests sparked by Yanukovich's refusal to sign an association deal with the European Union. 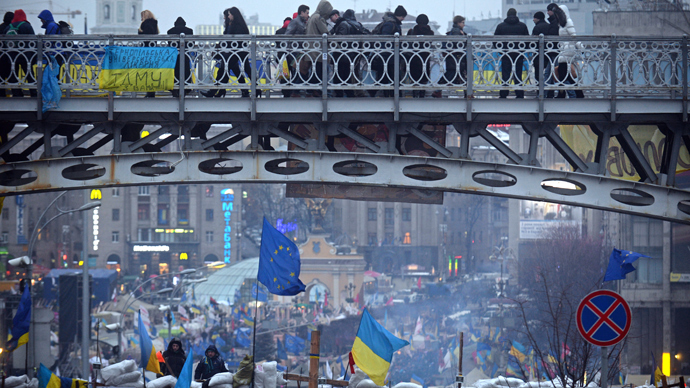 Pro-European protesters with blue and yellow Ukrainian flags have also been streaming to Maidan – or ‘EuroMaidan’ as it has been dubbed. Reinforced police patrols have been deployed to the area. To prevent clashes, police forces have kept the two rallies separate, preventing demonstrators from forcing their way through to the rival side. The opposition has called for a vast turnout on Sunday. Meanwhile, the country’s general prosecution is investigating the eviction of another opposition rally on November 30. Prosecutor-General Viktor Pshonka said that four top officials - the deputy secretary of the National Security Council, Kiev’s mayor, and then-head of Kiev police and his deputy - are being investigated on suspicion of abuse of office in the crackdown on protesters. Shortly after the prosecutor-general’s statement, President Yanukovich suspended the mayor of Kiev, Aleksandr Popov, and deputy secretary of the National Security and Defense Council, Vladimir Sivkovich, from office. “The investigation is preparing a request to the court asking for the two officials to be put under house arrest,” Prosecutor-General Viktor Pshonka said. The opposition said that the move is only a half-measure, adding that more people should be held responsible. "Each of the persons named has their own bosses who must have known about this crime," the opposition Udar party, led by boxing world champion Vitaly Klitschko, said in a statement. The opposition demands the president fire two of his closest allies: Prime Minister Nikolay Azarov and Interior Minister Vitaly Zakharchenko, whom it says are also responsible for the November 30 crackdown. 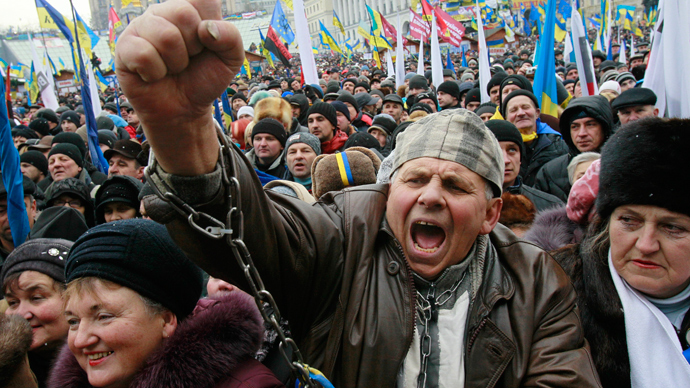 Since the violence, protesters have also been demanding Yanukovich’s resignation and early elections.